Simply stated, Hershey's milk chocolate candy bars melt in your mouth. Indulge in the creamy, rich, milk chocolate Hershey's bar and tantalize your taste buds with every bite. A delicious classic, Hershey's bars have made people happy for over 100 years. The Hershey's milk chocolate bar is America's best loved chocolate bar - and the only thing greater than the rich milk chocolate candy bar is its legacy. The original Hershey's milk chocolate bar hit stores in 1899 – and since then, the Hershey's bar has held on to its reputation of simplicity, purity and dependability. One thing that has changed for the Hershey's milk chocolate bar, however, is its wrapper. The first foil wrapped candy bars are long gone, and the new sealed plastic wrappers promise to maintain the ultimate freshness. Sweet City Candy offers Hershey's milk chocolate bars, available now at our low wholesale prices. Each box contains 36 individually wrapped candy bars in the standard size (1.55oz.). 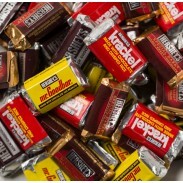 Order today and have your Hershey's chocolate bars delivered to your door from Sweet City Candy.